North-West Amateur Basketball League dominated once again on Friday afternoon, beating Saint Petersburg82-47 in an all-Russian gold-medal game of the W35 category. The game was relatively close in the opening quarter, with NWABL going up 18-13 after ten minutes of play. However, the floodgates opened in the second quarter as NWABL started the second period with a 15-0 stretch, which put them ahead 33-13 with five minutes remaining in the first half. Leading 47-24 midway through the game, NWABL cruised to the top of the podium. Meanwhile, Saint Petersburg earned silver medals. 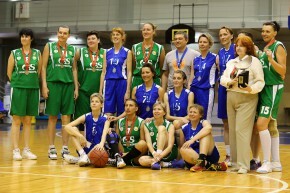 Mariia Kalmykova received the MVP award after scoring 26 points and grabbing six rebounds in the final, Anzehlika Boikova chipped in with 22 points and eight boards, while Olga Dobriakova collected 10 for the winners. Diana Bobrysheva had 16 points for Saint Petersburg, while Viktoriia Savushkina contributed with 10 points and 15 rebounds.